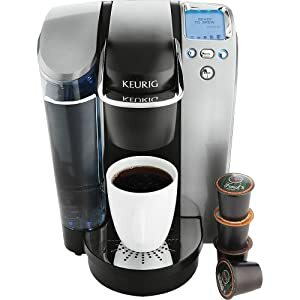 If you’re on the market for a good quality, fairly-priced coffee maker that won’t disappoint you in terms of coffee quality and ease of use, Keurig is the first brand you’ll be introduced to. Just have a look around instead and ask a handful of coffee fanatics and baristas. 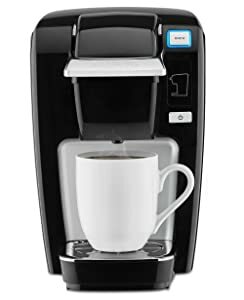 What we like the most about Keurig products, however, is that they evolve around continuous innovations, with advanced features and better functionality with every new product launch. They take buyers by surprise through their innovative approaches, and identifying what the buyer needs even before the buyer recognizes his need. That’s basically why there’s always a high demand for their numerous products, which we’ve short-listed in our review. This list will help you identify the best of Keurig, and easily narrow your search down to the ideal machine. These are our favorite Keurig machines. Keurig K55 is by far the best in terms of value in the Keurig line, with many bells and whistles to fall in love with. It features a fairly large water reservoir too - holding up 48 ounces and allowing you to brew about 6 standard cups back-to-back. The ease of use alone is a pretty good reason to buy it. Everything from filling the detachable tank to brewing and cleaning is child’s play. It also comes with clear-cut instructions, so you don’t have to worry about which button stands for which. Keurig K55 is not only compatible with K-cups of any brand, but can also be used with ground coffee! All you need is to switch the K-cup holder with your favourite ground coffee filter, and you’d be good to go! A beauty to look at, this machine comes in two attractive colours - black and red. Neither of them are small, with a footprint of at 9.8 by 14 by 13.5 inches. Additionally, you’d love the auto-off feature. It’d be great for a person who is always on the run. 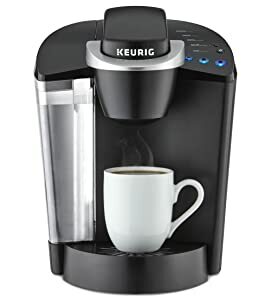 If you enjoy a good cup of coffee, without having to waste unnecessary time, then Keurig K55 is a great option worth considering. It takes only about 30 seconds to heat up, and 30 more to get coffee into your cup - leaving hardly anything to complain. A high-end machine for high-end users. If there’s one thing everyone agrees on, it would be the futuristic looks of Keurig B70 Platinum. Made up of black, chrome and stainless steel - and with a halo of glowing blue light, it can steal all the attention from your kitchen. What makes us rank it the ‘Best of The Best’ is not merely the looks. We covered many other areas including the 5 different cup sizes offered, the time taken to brew, and of course - the durability and taste of the brew. In fact: it scores high on the ease of use, specially since it features a touch control panel, an auto-off feature, and adjustable temperature control along with a digital clock. It is also flexible and can be used with K-cups and your own coffee grounds without a hassle. The water tank, on the other hand, is pretty big with a 60-ounce capacity and easy to refill through the hinged front opening. It doesn’t have a filter of its own, but comes with a holder.It also has a de-scale indicator that’d be helpful when its time for a clean-up. Though not uncommon, you get only a 1-year limited warranty to back your purchase. So don’t forget to clean it up after every use, and take good care from day one to lengthen its lifespan. 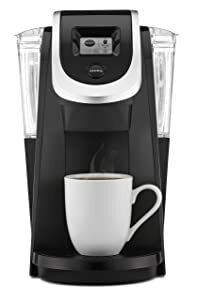 Keurig B70 Platinum is a premium-quality coffee maker for those who want to brew and enjoy a delicious cup of Joe in style. It’s also highly flexible, offering you the option to brew many other varieties of beverages. When space and portability become important - Get the K15. Never had enough room to accommodate a coffee maker? Well, not anymore. Keurig K15 Compact ensures you brew your favourite cup even in the tiniest corner of your kitchen countertop. Clocking in at 10.8'' H x 6.9'' W x 10.7'' D, it can serve one cup at a time, at 3 varying sizes. The removable drip tray allows even travel mugs with an average 5.2-inch height to fit right in. To make this compact size a reality, the manufacturers have removed the convenience of a high-capacity water reservoir - which means you need to refill it with every cup. It doesn’t boast many features either, which is expected given the size. It features an automatic shut-off system - enabling you to put your worries to rest if you happen to leave your kitchen without a backward glance. The functionality of this unit caught us by surprise - eventually creating its way into our list. It can complete a brew cycle, including water heating, in just under 2 minutes. The ability to brew from your own grounds would definitely thrill you too. However, you need to purchase a filter separately. As the name itself suggests, K﻿﻿e﻿﻿urig K15 Compact is a space-saving unit, ideal for studio apartments and kitchens with limited space. It can be used to brew not only coffee, but also tea, hot cocoa and iced beverages super fast. The price is well-balanced too - and will leave you nothing more to ask for. With many bells and whistles comes the evolutionary Keurig K545. Keurig K545 is another gorgeous coffee maker from the Keurig line with the industry’s widest range of 5 cup sizes. It can fix you a single cup in under a minute, and a carafe for your guests in less than 5 minutes. The removable water reservoir holds 80 ounces of water - enabling you to brew more than 10 cups before going for a refill. This makes things much easier. The brew is also customizable. You can brew just the perfect cup that suits your taste. Want to wake up for the smell of a hot, flavoured cup of coffee? Then simply make use of the Keurig K545 digital clock, and program it to switch on and off at your own convenience. On the downside, Keurig K545 features a sensor which scans K-cups that are not from Keurig. But chill: you can trick the sensor into thinking that it’s a Keurig K-cup after all. To do so, simply cut and tape the sensor with the Keurig K-cup foil lid. 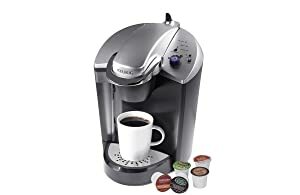 Keurig K545 is famed for its convenience with a programmable timer and a customizable brew. The best part, however, is that your settings don’t default - allowing you to save time in the process. It is also a beauty to look at, and comes highly recommended from our expert review team. A fast-paced, five-star model for a hassle-free coffee-making experience. Among other things like the looks and functionality, Keurig K475 is known for its speed. Not only is the brewing, but also the heating is done super fast. However, it’s not considered important as the machine can anyway be programmed to pour you a cup even before you leave the bed. With 5 cup sizes and 3 carafe sizes, Keurig K475 is a delight to use. It features a strength control setting and 5 temperature settings as well - enabling you to customize your cup and enjoy it to the fullest. Should the size concern you, remember that it carries a reservoir with 70-ounce capacity for your convenience. This will make refilling unnecessary for every cup or pot you brew. Not in the mood for coffee, but for a cup of hot cocoa in the middle of a wintry eve? No problem, Keurig K475 will fix it for you. In fact, it can be used to brew several other beverages as well - making it highly versatile. The 2.4-inch LCD Screen may evoke feelings of complexity, but be rest assured that it’s pretty easy to use once you get the hand of it. The machine is a bit bulkier compared to most other units in the Keurig line. So make sure to reserve some counter space before you hit the ‘buy’ button. 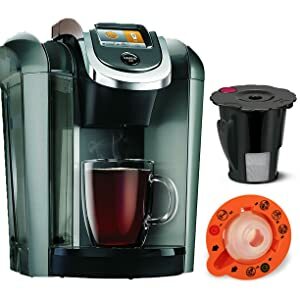 Keurig K475 is a handy coffee maker that is fast to brew, and easy to use. It also scores high on longevity, along with its performance standard. We hold nothing back in recommending it to coffee fanatics with an extra bit of counter space to spare. Keurig K250 is a slender beauty at its prime. 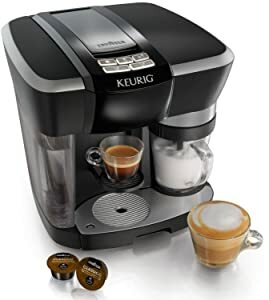 Keurig K250 is for those don’t want to spend a pretty penny for a high-end coffee maker, without compromising coffee quality to get there. It doesn’t feature many boastful bells and whistles such as a programmable timer, but still includes what’s necessary to make your brewing experience less painful. The Strength Control, for one, allows you to pick the ideal coffee taste and texture so that you can have your eyes roll to the back of your head as you drink it. No temperature control or an auto-off feature is found in this model. 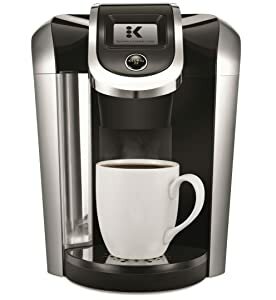 The size of Keurig K250 is both admirable and convenient because it’s going to save you some much-needed counter space. However, to do so, the capacity of the water chamber has been traded off. Instead of 60 or so ounces, It can hold only up to 40 ounces of water. Isn’t a deal breaker in our opinion. But note that Keurig K250 can brew only 4, 6, 8 and 10-cups. It doesn’t have the standard 12-ounce size. However, it can brew K-mugs and K-carafes too. Lean and tall, Keurig K250 doesn’t hog a lot of space - making it a great option for almost any household. It’s still flexible enough to brew 4 cup sizes and 3 carafe sizes in your own customized way. The price is affordable too, making it a must-buy. Office coffee has gained popularity for its burnt and foul taste. Thanks to Keurig K145 OfficePRO, it’ll no longer be true. Specifically designed for office use, OfficePRO is known to sustain heavy, daily abuse with a longer pump life. It’s bulkier and more durable than an average home model. Though it doesn’t come with many bells and whistles, the longevity beats everything else. It has 3 cup settings from 6-10 ounces and a convenient 48-ounce water chamber. The water chamber can be removed for refills and features a ‘Drain brewer’ option that allows you to completely drain the brewer. After the initial heat-up, which takes no longer than a minute, brewing is done superfast in less than 30 seconds. What’s more: Along with a wide variety of coffee, OfficePRO can also brew hot chocolate, tea, iced beverages and just plain hot water! The absence of Quiet Brew Technology in this machine makes it operate louder than a home model. But keep in mind that it comes with the benefit of a stronger pump and a faster brew that’ll end up making you forget all about the noise! The common gripe related to OfficePRO comes from the inability to use reusable K-cups. All you need is to perform a simple trick by pulling out the plastic piece that says "Caution Sharp Needles" - and you’d be good to go. Advertised for heavy-duty office use, Keurig K145 OfficePRO is the definition of longevity. It’s also fast, efficient and brews an excellent cup every time. We hold nothing back from recommending it to serve your office. If milky beverages are your thing, end your search right here. The Keurig Rivo is famed for many reasons, but the price is the initial siren call. Which also means that you no longer have to dig deep into your pocket to get your favourite cup. Shaped cutely like a cube, it can accommodate a cup of cappuccino and milk side by side for added convenience. The frother has turned out to be one of the biggest selling points, with 3 modes from Cappuccino, Latte, and Cold Froth. It’ll make your mouth water with a commercial-level texture - and save you plenty of bucks. It can brew only two shot sizes, which is quite acceptable considering the price. The brewing process is usually completed under a minute, helping you save precious time during the rush hours. The taste, on the other hand, is ideal for lovers of Italian Lavazza. But if you’re used to very strong coffee out of over-roasted beans, then stay away from Rivo - it’s not for you. For an espresso machine, the Rivo is surprisingly easy to use. However, on the downside, it’s compatible only with Classico, Instenso, Delicato and Decaf pods. If you’re not a fan of them, this isn’t going to be your machine. Be realistic about the amount you spend to get Keurig﻿﻿ ﻿﻿Ri﻿v﻿﻿o, then it won’t serve to be a disappointment. In fact, it performs the best at this price point, and the Lavazza coffee quality is as same as shop-bought. Does it take a different size pod to make a carafe then a single cup? How do you regulate the strength. If used to make tea, is the strength different then steeping for 4 minutes. The water would just go straight through tea bag into cup? What type of fitting is needed to direct plumb a larger Keurig office pro. My only problem is that the wall plug sticks out three inches. Change design to a right angle wall plug, it would greatly help in counter space!!!! I have had 3 machines so far, they last an average of one year. The latest one is almost a year old and only gives a quarter to half cup of coffee which means I have to try 2 to 3 times to obtain a full cup. Very frustrating. Any suggestions? Gotta clean out needles regularly. I drink 6-10 cups daily and Keurig’s just need maintained. Run a water cycle between brews, it keeps it clean and preheats the coffee cup. I’ve had mine for nine years and never had a problem. Maybe clean it regularly. How do you clean the needles or get the cup thing out? I read the instructions but am still having a hard time and have almost hurt myself. I have NOTHING BUT PRAISE for this coffee maker. We have loved it! By the way, we have used it EVERY day, 4-6 cups per day, for 4 YEARS and 8 months. It’s a great workhorse! We will be getting another K70 today. I absolutely love my Keurig! Best coffee maker I have ever bought. Guests choose what flavor they would like and feel comfortable making their own .